Stories make your brand stronger and will create stronger relationships with your clients. One of my earliest childhood memories is of camping with my family and sitting around the camp fire telling stories, laughing and letting our imagination run wild. We connect best through story, and in business it’s no different. Story telling is the glue to your business, it’s the piece that attracts your audience and pulls them into wanting to learn more about you and want to stick around to learn more about how you can help. When I started my business, I was afraid to be vulnerable and share my true self. It took me a bit of time to realize that the more open and authentic I was about my journey, the easier it became to build relationships and to meet my ideal clients. It’s hard to stand out in business when you do the same thing as everyone else, but when you add your story as part of your brand you create a unique advantage that sets you apart. No two people have the same story so when you open up and share from your heart and your experience your able to connect at a whole new level. 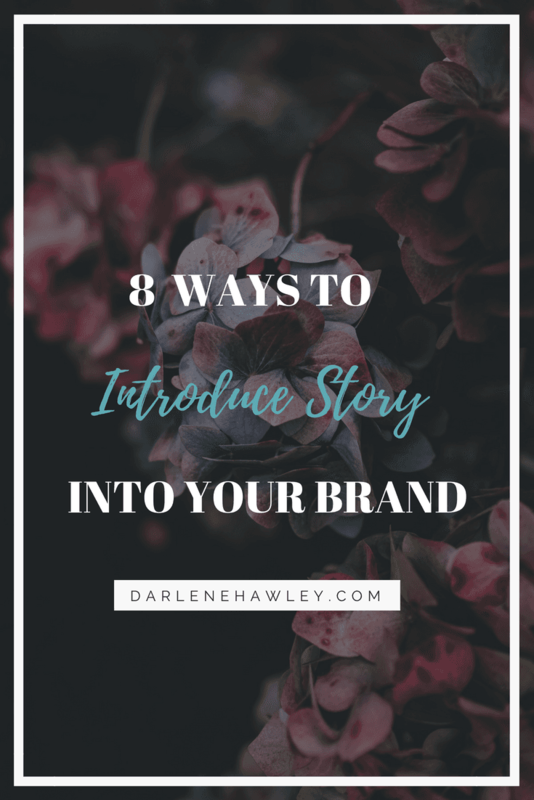 If you’re not already using story telling as part of your brand building here are 8 ways you can start using story to build your brand. This is a story that walks you through where you were to where you are going. This story builds on your journey as a business and gets deep on the struggles, lessons and strengths that we uncover along our journey. These stories celebrate the success of the brand and reinforce how hard work and dedication can move mountains. 2. What was a low point in your life or business? 3. What was the turning point? 4. What makes you credible to help now? What is your deep, driving force behind your brand that’s not just, “I want to make more money.” For some entrepreneurs, it’s freedom. For others, it’s improving the ways humans interact with each another or how we take care of our health. Your why will help you built a brand that is strong and purposeful. 1. Why do you do the work that you do? 2. Why are you passionate about helping people in this area? 3. Why do you work with the people that you do? 4. What drives you to get up and work each day? 5. Was there ever a time in your life that you needed the work that you do? Share from your heart, you are a real person and your audience wants to get to know who you are. It’s important that you’re not always selling but showing your true self and letting your audience get to know who you are. Show off what makes you unique or different. 1. What hobbies do you have outside of your work? 2. What is your family life like? 3. What’s your favorite TV show? Book? Podcast? 5. What’s something you’re really bad at? 6. Where have your travels taken you? 1. I help my clients transform…. 3. What do you really do? 4. What do you really love about your work? 5. Who do you really work with? 6. Hi, I am (name) and I’m a (insert title). I help (who do you desire to help) to (what immediate struggle does your client need to overcome) by (what is the solution you provide) so they (clients big goal or dream). Share your brand values. What is it that you stand for, what are your beliefs, your non negotiables when it comes to you and your business. Ready to write your own Brand Value Stories? 1. Explain what was wrong. Why did they want/purchase your product or service? 2. How did they FEEL before working together? 3. What did you do for them? 4. What was the result? 5. How did you improve his/her situation? Or life? 6. How did they FEEL after? Start connecting your story with a call to action. After your share, it opens you up to introduce next steps. Don’t be afraid to invite your customers in and let them know how they can work with you. What is it that you want your audience to do know that they have learned about you? 1. That was my story, and if it sounds a little like your story too, that’s why I’d love for you to …. 3. So, if you’re interested, I invite you to …. You can use story on your website, in social media posts, in your email or even at networking events as you connect with new contacts. Look at each piece of content you create and make sure you add just a tiny bit of your story to everything you share. People want to get to know you and like you, so they can stay and do business with you. Your audience loves story, and now that you have some story ideas to work from. I invite you to spend some time writing out 5-10 stories that you can share to grow your relationship and connect with them on a whole new level.